This week we hear from Sean Stevenson of Westville Group about his experience of hosting two Postgraduate Placements Nottingham (PPN) students. Westville Group is an experienced construction, insulation and rendering services supplier to both residential and commercial clientele. Westville’s history dates back to 1988 when our Chairman Jon Stevenson realised the growing importance of insulation products and the role they would play in the construction industry throughout the twenty first century due to climate change, increasing energy prices and decreasing energy resources. To date we have worked on over 130,000 projects and properties in both residential and commercial sectors. We are always seeking new ways to promote the adoption of low carbon technologies and the University of Nottingham’s PPN programme offered us a low cost way to access the cutting-edge knowledge and skills of their postgraduate researcher population. 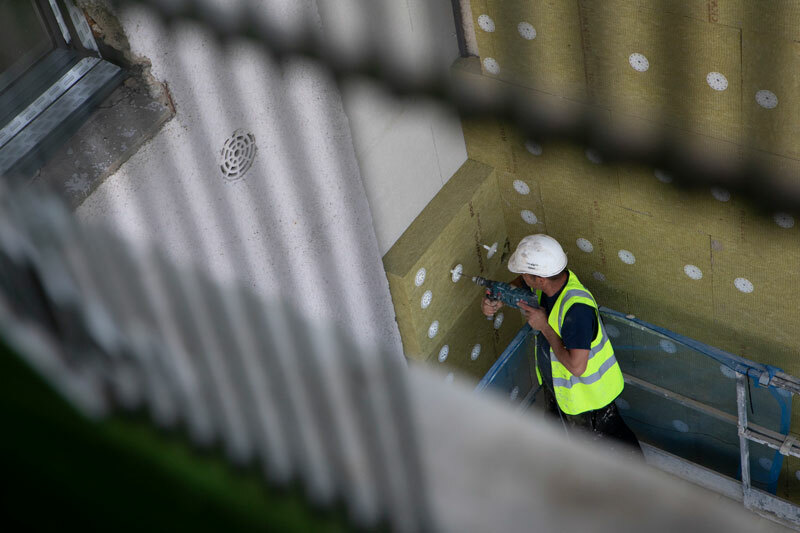 We worked with the PPN team to identify two candidates that fitted the profile we needed and were pleased to be able to host an architecture researcher and an engineering researcher because their complementary disciplines brought additional breadth to the project. The recruitment process was really well set up by the PPN team, with great support around the initial interviews, and we found all of their administration to be slick and painless. The specific project we undertook with the support of the UON postgraduate students, Soni and Victor, focused on creating a database of property construction types across all the wards in the city of Nottingham boundary. The aim was to be able to identify by area and street properties that would require a solid wall insulation solution (internal and external) to improve their thermal performance. We also hoped to be able to identify conservation areas and main heating sources (i.e. gas / electric / solid fuel). All of this information was to be collated into a mapping process to assist in the further adoption of low carbon technologies. Opportunities for supply chain development through the identification of technical solutions for specific housing typologies would also be recorded. Since our project was not time sensitive I was happy to work around the postgraduate students’ academic schedules and I purposely set Soni and Victor a looser brief to allow scope for them to add value according to their own independent skills and insights. This worked well because as postgraduate researchers they were used to working in a self-sufficient and flexible manner. With such a good project-team in place we worked quicker than expected and over-delivered against the project requirements, mapping the data from 14 district areas instead of the 2 originally envisaged. We have already used these outcomes of this work to help local Councils target people in fuel poverty and in need of improved insulation. So the tools are live and being used – not on a shelf gathering dust. I think the success of the project was rooted in a combination of the good candidates, recruited through Postgraduate Placements Nottingham (PPN), and the room we gave them to add value and flexibility of approach to outputs as opposed to strict working hours. This placement was joint-funded by PPN and the Energy for Business project. 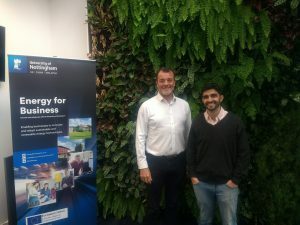 Energy for Business can support SMEs who are energy innovators and those who want to become more energy efficient by forging links between businesses and world-class academics, researchers and graduate talent in the energy field at the University of Nottingham. Delivered by the Energy Innovation and Collaboration team and funded by the European Regional Development Fund (ERDF), this low-carbon project offers product innovation, business support and capital funding to SMEs in the Derbyshire and Nottinghamshire regions. If you are a company interested in hosting a postgraduate placement student please visit our webpage for more information.